For all of you that hate flying and for all of you that hate flying with a baby on your plane and for all of you that hate flying with a screaming baby on your plane—I apologize. 2. If you mention the word ‘puke’ they let you cut in line through security. 3. Apparently white substances over 3ml must be tested for possible bomb material even if it is in a baby bottle. And the baby is drinking it. 4. A gate agent will not be very helpful if you politely ask to change seats. If you hold a screaming child inches away from their face and say, “WE HAVE HAD A VERY ROUGH DAY. I’M SURE YOU COULD CHANGE OUR SEATS TO AN EMPTY ROW.” --- They are much more accommodating. 5. Flight attendants will not provide hot water. They will however fill an air sickness bag with hot water and let you warm the bottle in it. 6. People are nicer than you think. Ellie cried non stop (well she stopped for 10 minutes) during a 90 minute flight. I kept apologizing to the people around me. They all smiled, and nodded reassuringly saying “it’s fine. We understand.” Of course they were lying but I appreciated it. 7. The bottle you bring on the plane for your baby to drink to help her ears during take off and landing will be entirely consumed before you finish taxi-ing to the runway. 8. Therefore your baby will probably cry during take off. 10. 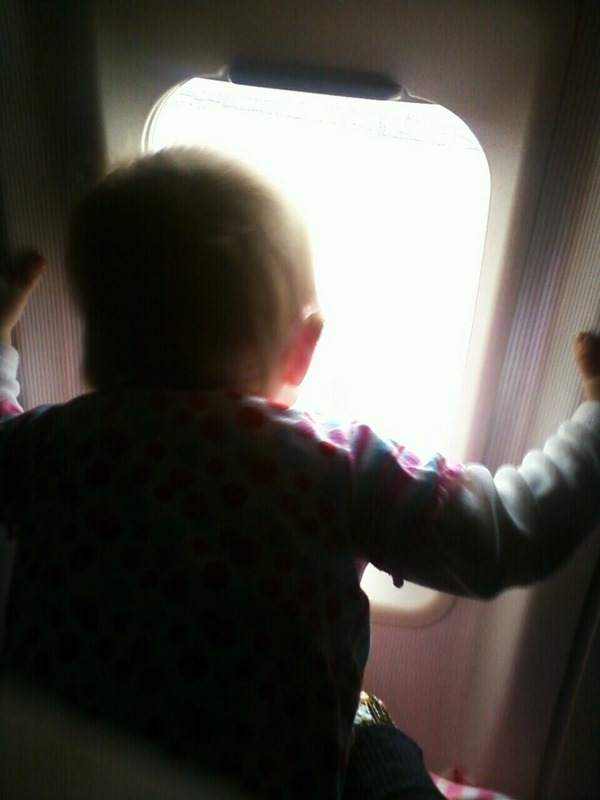 When your baby looks out the window with her little nose pressed against the plastic amazed that she is taller than the trees and face to face with clouds – you should probably take a moment to be amazed too. 11. Let the nice woman sitting next to you hold your baby if she offers. She probably really wants to hold a baby. Ellie cried with me and then stopped with the distraction of a new face. And I think it made the stranger’s day- she thought she must be a baby whisperer. Fine by me. 12. Say no when the beverage cart comes around. Just say no to an open cup of liquid within an arm’s reach of a baby. No. Even if you’re thirsty. Really thirsty. No. 13. Seeing the faces of family is always worth it. I am grateful that we live in a country that we can freely travel in, and thankful for the money to be able to do so. Ignore the face of the person next to you when they realize they won the coveted seat that’s in front of the bathroom and next to a crying baby. Ignore the tight seats and huge diaper bag so zero leg room. Ignore the stress. Ignore the million of little germs shooting down on you and your child from those air conditioners. The faces of family are always worth it. The face of family is always worth it.